From L to R: Alex Brown, Head of Capital Projects; Councillor Angus Ross, Strategic Asset Lead Member for Royal Berkshire Fire Authority; and Dom Manton, Group Manager for Learning and Development. 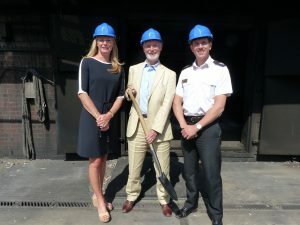 Royal Berkshire Fire and Rescue Service’s (RBFRS) Firehouse is set to be completely re-configured to provide a contemporary facility for firefighters’ training. On 9 July, work began to refurbish the Firehouse and it is anticipated to be complete by September 2018. Before the work started, the team leading this development met for the groundbreaking. The work will replace the control systems and reconfigure the internal layout of the Firehouse, which had become familiar to firefighters, as it had not changed in approximately 15 years. The new specification also includes additional fire fighting areas, an improved Liquid Petroleum Gas (LPG) kitchen, a bedroom layout and access to the third-floor loft space to increase usability.